The Marley led reggae army Ghetto Youths International is mobilising. In 2013 the whole organisation got a showcase with the compilation Set Up Shop Volume 1. Then they put out two Damian Marley produced EPs to signpost albums from their alumni – one classic from singer Christopher Ellis and one cosmopolitan from deejay Wayne Marshall. 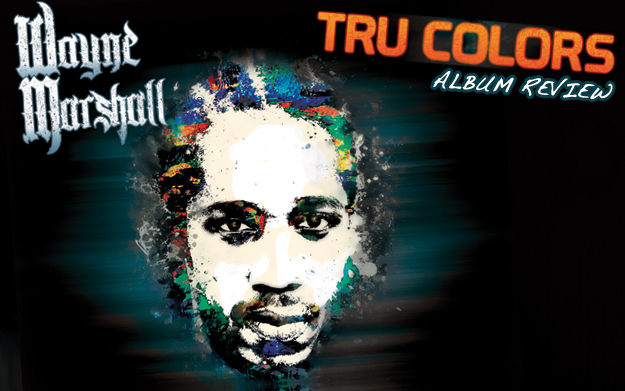 Marshall’s is first off the blocks in 2014 - titled Tru Colors like the EP. Ghetto Youths followers will be hoping that this will be followed by Christopher Ellis and then the long awaited sleeping giant – Stephen Marley’s Revelation Part 2 - The Fruit of Life. Maybe a new set from Damian might happen too – who knows? But let’s get back to Wayne Marshall’s album. It begins with a lengthy spoken word intro about its concept and his motivations as per Busy Signal’s Reggae Music Again (understandable considering this is only Wayne’s second long-player with ten years gap between the two). He warns that it contains a wide range of genres and messages – as if answering critics pre-emptively. Certainly it’s a very diverse affair. There’s layered, lavish, autotuned histrionic dancehall (ensemble hit Go Hard featuring Assassin, Aidonia, I-Octane, Bounty Killer, Damian Marley and a phone recorded Vybz Kartel; and its less guest heavy if overblown remix Go Harder enlisting Baby Cham plus rappers Ace Hood and a figuratively phoned in Wacka Flocka Flame). There’s reggae (the superb thug roots of I Know, and On The Corner - a brilliant Busy-style appropriation of REM’s Losing My Religion that will outrage their more sanctimonious fans). There’s dance music (Longtime with its primordial sliding bassline and New Jack Swing era harmonies). And of course, there’s the hip hop that Wayne has been deep into since his debut (The betrayal themed title track – thankfully not a Cyndi Lauper cover). Stupid Money, the standout of the EP, remains the standout of the album. It’s child sung bridge “I’m a gonna make it better one day” reminds that it’s not selling celebration of wealth as much as hope for it (ignoring Lorde’s bored voice of the suburbs saying “Oh come on you’ll never be that rich” – because wanting to dress up, look your best and dream remains as valid a response to poverty as celebrating it). Similar themes are explored in Success Story – which throws together business moguls and civil rights heroes in the name of making the most of capitalism (it’s one of the few songs where you’ll hear Marcus Garvey in the same bars as Angelina Jolie). Oddly the more socially conscious tracks are the less memorable. Strike Dem with Capleton combines curious metaphors (pints of blood resting on shoulders?) and spooky Theremin. Bounty Killer’s anti child molestation anthem Be On The Alert has a worthwhile message but goes into too much detail over a jaunty melody (for the benchmark handling of this topic YouTube Papa Levi’s still unreleased song about Gary Glitter). Of the numerous guests, the most potent spice in the pot is Agent Sasco whose voice strengthens everything he touches (it would be great to see a Damian helmed Sasco project). With so many different styles and moods Tru Colors is likely to be a mixed bag for all but the most omnivorous of palates. It also sounds like it belongs more to the last decade than this one - and many of the biggest tunes are already known from singles. Yet the songwriting and Damian Marley’s production maintain a standard throughout, and the ordering is thematically well chosen – even if it serves to show what a contradictory bunch of characters Marshall is. This is a solid, well-crafted Jamerican sounding album that will appeal to those who aren’t feeling the new wave of Jamaican roots right now – or just like to hear reggae and dancehall throwing eclectic shapes.